﻿﻿ ARUN - Social Investment Platform | [Partner’s Essay] I Run the Charity Marathon. [Partner’s Essay] I Run the Charity Marathon. I would like to give you a report of the 18th Angkor Wat International Half Marathon that I participated in, held on December 1st of last year. Before talking about the day, I will share my impression of visiting Cambodia after 10 years. In every aspect, I was astonished by the changes the city has made. Especially, the increase in the traffic was shocking. I used to use motorbike taxi (motodop) as the main transportation method, but with so many cars, it became too dangerous to use it. I understand why tuk tuks (a carriage with seats pulled by a motorbike) increased and became more popular. I gave up riding motodops and used this new transportation method, tuk tuk, as the main mean of transportation during my trip. After enjoying the busy capital Phnom Penh, I flew to Siem Reap where the race was held, a 45-minute flight away. I hear that many tourists now use buses to travel, which means the roads have improved. Once in Siem Reap, I encountered an unbelievable amount of traffic, though not as bad as Phnom Penh. Traffic lights are beginning to be installed, and as one who saw the time when they were scarce, I was excited and thankful for the existence of working traffic lights. 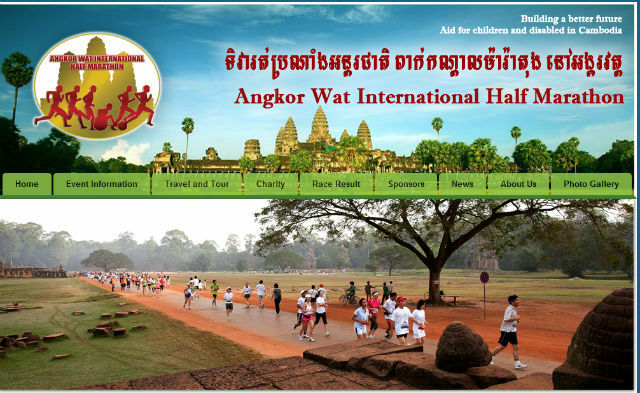 Angkor Wat International Half Marathon was first held in 1996. It is a charity marathon whose entry fee is donated to support the distribution of artificial limbs to landmine victims, both independent living and returning to society, as well as for the prevention of HIV/AIDS among youth. This year marked the 18th marathon, and it especially was a memorable occasion, because the Japanese non-profit organization, Hearts of Gold, which had been supporting the event since its 3rd year had transferred all the management to the Cambodian Olympic Committee. The participants have increased by 20% since the last event, counting 7,579 runners (including 437 Japanese), the most participation so far. It became an international event with 75 countries. The international flavor was obvious from the voices I heard when I lined up at the starting point. The attraction of this race is that you can run through the World Heritage Site, Angkor Wat ruins. The course of the half marathon is almost the same as the short route that is known as the popular sightseeing route of the Angkor Wat ruins. Passing through the South Gate, foot of the Phnom Bakheng (End of 9th Century) and come back to Angkor Wat. Not all the ruins are seen from the route, but in Angkor Thom, you are running toward the enormous ruin, which gives a vivid sensation that you are running through the ancient ruins. Different from a typical sightseeing, feeling the air on my skin, I felt as if I was immersed in the vast history and worldview of the ancient ruins. Despite my worry about the heat, the temperature was comfortable. As the starting time was 6:30 am, I headed for the event in the still dark sky, feeling the chilly wind on a tuk tuk. We started the race just when the sun was coming up, thus avoiding the scorching heat, and were helped by the shades of trees along the road. The route was flat, and it was a very kind route for a beginner like me. I was a little surprised to see quite a few Cambodian runners among many oversea participants. In this hot country where the physical education classes in schools were not well developed and the field day did not exist, I was happy to see the sign of “marathon” getting popular. Another surprise was that occasionally, the village children cheered me on, yelling “Ajinomoto!” The Japanese seasoning, “Aji-no-moto” is popular among Cambodian households, and is used in many forms. Japan is associated with Aji-no-moto, and when a Japanese person passes, the children cheered “Ajinomoto!,” which was a little embarrassing. But the smiling children on the side of the route who want to give high-fives kept my spirit up when I felt like walking. Thankfully, I finished the half marathon, and the warm atmosphere of the event makes me want to run again. The Cambodian Tourist Bureau lists other International marathons such as Sihanoukville International Half Marathon and Angkor Empire Half and Full marathon in July. There seems to be a half marathon in Phnom Penh in June. Our relationship with Cambodia is through investment, but how about another way of getting involved in the country? If you are thinking about running as a way of sightseeing, I recommend that you do the sightseeing before the marathon. Sightseeing Angkor Wat ruins requires a lot of stamina because you will be walking through a very hilly terrain.